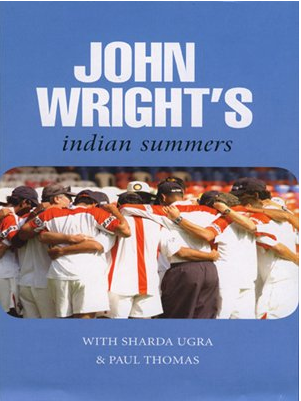 A couple of points about the book - Wright almost never drops names, he writes about controversial topics without resorting to being sensationalistic (the Dravid declaration in the Multan test when Tendulkar was on 194* for example). The second point is that Wright ultimately comes across as a very decent man with a genuine love for India - which is very heartwarming indeed (contrast it with the rather disgusting 'In Spite of the Gods' by Ed Luce). Care to guess who Wright's talking about? In Jodhpur, a guy with the biggest diamond ear-studs I'd ever seen wandered into our viewing area as if it was his private box. I went nuts demanding to know who the hell he was and, more to the point, who the hell he thought he was. The answer to both questions was that he was India's biggest beer baron. [page 43] - it's the one and only Vijay Mallya! What he is spot on, and this is especially true of the press and former Indian cricketers who go overboard in running down the Indian team, may also be a consequence of our 'atithi devo bhava' culture take a step or two too far. Anyway, John has no love lost for the Australians, as is evident from the last sentence! On the security arrangements for the historic Indian tour of Pakistan in 2004: When our manager, Professor Shetty, Sourav Ganguly, and I went for a routine meeting with the match referee Ranjan Madugalle, there was more hardware in evidence than at the gunfight at OK Corral. ... Whatever you called it, it was a lot of trouble to go to just so that we could have a cup of coffee with the match referee. © 2007, Abhinav Agarwal. All rights reserved.